Today we celebrated my youngest daughter, Mary Pearl’s, second birthday. And after two years I am finally ready to tell that story. About two years after the boys had all been diagnosed with Duchenne Muscular Dystrophy I had my heart checked. As a carrier, there was a chance my heart could be affected. And it turns out, my heart was affected. I was diagnosed and started medicine that did not make me feel good. After four diagnosis-es I was distraught. At the time I would never had admitted it, but now I can see I was depressed and reaching to make things right again. I home-schooled the boys that year, trying desperately to slow down time. At that point, I just wanted the hands on the clock to stop turning. I wanted to be stuck there. I wanted to be stuck forever where all of my children were healthy and alive. That was also the year Max was accepted into a clinical trial that was showing promise,real promise, at slowing down progression of the disease. Those things, home schooling and the clinical trial were distractions. I could tell myself I was tired and sad and lost because those things were hard and those things were exhausting. Now, I know I was trying desperately to do anything except feel; feel the pain, feel the joy, feel any support; I did not want to feel anything. I was praying and begging not to feel. To feel meant to hurt and I did not want to hurt anymore. After meeting with our parish priest, he suggested a healing Mass. Jason and I were completely willing. Our priest was able to get a relic from Father Michael McGivney. We sent a novena to all of our friends, family, social media accounts. We prayed it everyday until the Mass. The Mass was beautiful. We prayed for healing, we prayed for a cure. Four or five months later, I realized I was pregnant. Honestly, I was not happy. I was scared to death. 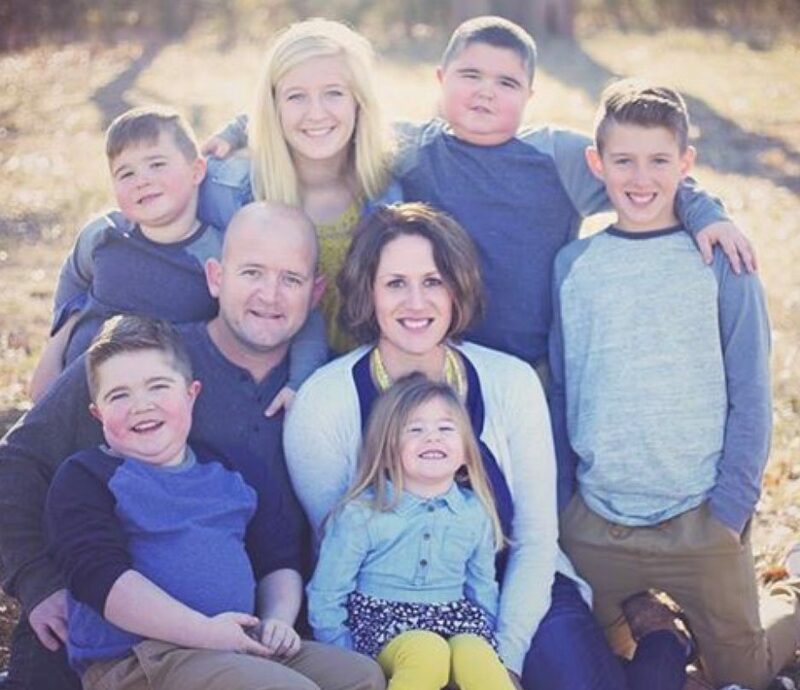 I already had three sons with Duchenne and I was as scared as I have ever been about anything that I was pregnant with another son with Duchenne. For 17 weeks we did not tell a soul. I even begged my husband to call our doctor. I didn’t want any “I told you so’s.” Jason asked him not to question our decision and just be our doctor. We were blessed to not only have the doctor be a doctor, but he turned out to be a support system and friend through it all. After the three boys were diagnosed. We decided we could not have any more children. We didn’t decide if we wanted more children or not, we just decided we could not. We could not risk another son with Duchenne. And yet we did not do anything permanent. We decided to stay with Natural Family Planning. Duchenne already promised to steal so much from us. We decided we could not let it steal our faith. We continued to follow the teachings of the Catholic Church. At 17 weeks pregnant we were scheduled for a ultrasound to find out whether the baby was a boy or a girl. Our appointment was scheduled for 1:00. I went to Noon Mass. I went to prepare myself for another son with Duchenne. After Mass I lingered. I sat in the pew for awhile; avoiding any rush to get to the ultrasound and preparing myself for another son with Duchenne. How do you prepare yourself for that? Call her Mary? Her? Mary is a girl’s name. The baby will be a girl? I couldn’t understand. Mary Pearl Vertin was born September 25th at 4:47 am. She weighed 6 lbs, 5 oz and was 21 inches long. She was our miracle. When I first laid eyes on her, my breath was taken away. She had the darkest brown eyes I had ever seen and she looked directly at me; her look was slow, she was not flailing or screaming. She just keep eye contact with me. It was powerful. Mary has brought so much light into our lives. She brings laughter and love and cuddles into our life. She brought life back into my life. We were so muddled in the diagnosis. We were so focused on the 20 year future that meant we would lose our children. I was distraught. I was not a good wife or good mother. I hurt the ones I love because I was hurting so much. When Mary came, there was light again. All children are heaven sent; but Mary’s purpose…well I think I know, but always wonder. Remember that healing Mass I talked about. I believe Mary was the answer. We prayed for healing. I had a cure for Duchenne in mind. God gave me Mary. Mary was glue for my broken heart. She helped me piece it together again; maybe she helped me peace it back together again. She brought his wife back to my husband. She was a sister to my sister-less daughter, she was small and innocent and needed help that even a weak boy with Duchenne could give her, she was a healthy sibling, she is a soul sister to a little boy with brown eyes, and a play mate to our youngest. I will never stop being thankful. Had we followed the temptation, the suggestions from many to have done something permanent instead of following what our hearts were telling us to do, we would have robbed ourselves of the joy and healing power of this one beautiful child. I changed the name of the blog and now have my own domain! The first blog I wrote nine months ago was titled Weathered Storms. That is what I should have named the blog then. My life is a series of Weathered Storms. I am an on demand mom, but the things I write about are the storms that come along with life, not just motherhood. I am ready to step it up a notch on my writing. I hope to see my blog grow some more over the next year or so. I want to be a writer. There, I finally said it! It only took me 36 years and two degrees that have nothing to do with writing for me to finally admit that is what I want to do. I will go one step further by saying I really hope to write a book in the next year or two using the blogs as an outline. It is time for me to take this serious and pursue something I always wanted to do, but never thought it could be. Seriously, God has given me a lot of life to live thus far; it is like paint for my canvas. September has been a hard month for me. It is what spurred me to change the name of the blog and use it to find peace. Writing is therapeutic to me. I make realizations when I write. I let go of a lot of baggage when I write. It is one way I take care of me and it is time to take care of me. The first week of September I was at the hospital with my three sons who have Duchenne. It was the first visit since diagnosis that progression of the disease took front seat. It hurt. I found myself in an intense grieving, again. As the last two weeks have gone by, each day is a little better, but I’m still visiting that grief much too often. My home life as a child was abusive. I survived and I forgave. And I thought that was enough. But I’ve realized I believed all the terrible things I was told about myself as a defense mechanism. I never want someone I love (or anyone) to say or do something that can hurt me like I was hurt before. As a result, I am not gentle on myself, in fact, I usually believe the very worst about myself; because if I already believe how horrible I am, it can’t hurt me if someone else tells me that (at least that is what I tell myself). But it is not fair to me or the people God has put in my life. I am carrying a cross I was never meant to carry when I do that. I don’t know why it has taken my so long to finally admit, I need to change. I also know it is part of the other open wound on my heart. I am a carrier of Duchenne Muscular Dystrophy. And although my brain tells me one thing, my heart is holding on to something else. My heart cannot forgive me for passing this genetic killer onto my children. I know it is not my fault. I had no idea what Duchenne was, much less that I was a carrier. It is not a punishment for something I did. God doesn’t make mistakes and my boys are meant to be here just as they are. I have to let it go. I cannot blame myself. And I’m beginning to understand that it is not something I need to forgive myself for. Because again, it is not a cross I was ever meant to carry. I have these big things brewing inside of me like a storm. And then there are all these other components of the storm circling like dark clouds in the sky. I am trying to hold on to all this pain because I struggle to believe that I deserve not to hurt. I forced myself to believe all those terrible things I heard as a child. And sometimes I just want to pout and be childish and ignore God’s will for me. And sometimes I just want to hold onto all of it because giving it to God may not give me what I so desperately want. I want my children to live a long healthy life and I am so afraid to give it to God because I am scared he has other plans. And maybe his plan it exactly what I pray it is. I need to take that leap and find that healing. But I tell myself I want to be miserable. If my children have to suffer, then I think I must suffer too. But, if any of you have met my children…they are not suffering. They are happy children, bursting with life and a real zest for it. All that suffering is not meant for me. I have to stop punishing myself, because God isn’t punishing me. He is loving me and forgiving me, and being patient with me. Those are the storms I am weathering now. It will be a process, but now it is my turn to love me, forgive me, and be patient with me. I hope to write more about those storms, specific feelings and memories. It will be a healing process for me. And I hope sharing my process can help others with their own journey. It is time for me to see the rainbow after the rain. I know there will be other storms, but I am going to learn to remember there will be other rainbows too. This is a blog that I’ve been thinking about for a while now, but thanks to coffee with a friend this morning where I explained it out loud, I was inspired to write it down. Strange title I know. But my world, my reality…it is strange to me. There are many days that I think this must be what Alice in Wonderland felt to wake up in world completely backwards and foreign to her. We had pie the other night after supper. Dishes were done and the kitchen was clean. I was wrapping the pie in Saran Wrap when my 23 month old Mary, stuck her arm straight out and excitedly motioned for me to wrap it around her arm. The toddler goes with us to a majority of the doctor appointments. We don’t have family close by to help watch her and we have way too many appointments to pay a babysitter every time with our already tight budget. Mary has been with her brothers through countless blood draws. When our 5-year-old Charlie has a blood draw he is scared to death. Over the years we figured out that a little bit of “numbing cream” on his arm before the blood draw makes a world of difference for him. Instead of holding him down kicking and screaming, he will sit on our lap and hold our hand. We keep the numbing cream on with Saran Wrap. Because the toddler wants to do everything her brothers do, we wrap Saran Wrap around her arm (without numbing cream) each appointment. In her world, in our world, in this world we never dreamed we would be part of, that is what Saran Wrap is used for. This makes me think of the term “service toddler.” This is a term I first heard a couple of years ago via social media. I remember thinking, “what?” “How odd?” But I didn’t have a toddler at the time and my sons’ needs at the time were not as great as they are now. But now, it is a term I know in my heart. Now, this little girl we have been blessed with; this little girl who goes to all the appointments; this little girl knows her brothers’ needs before they do. If they forget something she takes it to them. If something is too heavy for one of them she carries it for them. Yes, the 23 month old can more easily carry her 7-year-old brother Rowen’s iPad than he can…one of the heart wrenchers that is part of this world we never expected to be part of. If they drop something she picks it up. And when they are scared or tired or burdened, she is the one that brings them smiles and calms them. Even more amazing and awe-inspiring is that with the 7-year-old she shares a twin like connection. I don’t know how to explain it except that it is like watching a piece of a miracle unfold every day of my life. We have six children. Three of them have Duchenne. Three of them do not; but it affects all six of them. The love these six kids have for each other, it gives me goosebumps (at this point I am actually typing through tears). It makes me wonder what I ever did to deserve to be part of it. The youngest has learned to serve others at a year old. The only healthy brother, is forever their defender. If a wrong is every suffered by one of his brothers, he is the first to know and the first to act. And their oldest sister, she is a caretaker that can give their medicine, put on their night braces, stretch their muscles; and she has shown an early interest in the medical field. It stems from her desire to be the most help possible to her little brothers. This love I see in action everyday; even between the normal sibling arguments, annoyances and jealousies… This love is stronger, more fierce, more inspiring than anything I could ever have expected to be part of my world. It is a hard, sad, joyful, blessed, stressed, strange world I am part of.